In 1937 the Colonel of The Queen’s Royal Regiment, Major General Sir Wilkinson Bird KBE.,CB.,CMG.,DSO obtained consent in principle for a new Regimental Chapel to be within the precincts of the new Cathedral, then being built in Guildford. During World War Two no further action could be taken, but after the war General Sir George Giffard GCB.,DSO who had succeeded to the Colonelcy of the Regiment, again approached the Cathedral authorities, and in 1954 they offered the Regiment the only Chapel then built - on the North side of the Transept - on the understanding that the Regiment would furnish it. An appeal was launched. The total estimate in 1954 was £5500 but the figure rose during the building phase to £6500. By this time, Major General J Y Whitfield CB.,DSO.,OBE had been appointed Colonel, and was to be the last Colonel of The Queen’s Royal Regiment. The general plan had been that units, organizations and individuals should, whenever possible, make their gifts from the items listed in the appeal; and this plan was followed. Since the Chapel’s original dedication additional items have been added to commemorate The East Surrey Regiment. Following the amalgamation in 1959 of The Queen’s Royal Regiment and The East Surrey Regiment it has been the Chapel of The Queen’s Royal Surrey Regiment. This was originally the Chapel of The Queen’s Royal Regiment, raised in 1661 to provide a garrison for the fortified port of Tangier, part of the dowry of the Portuguese Infanta, Catherine of Braganza, on her marriage to King Charles II. 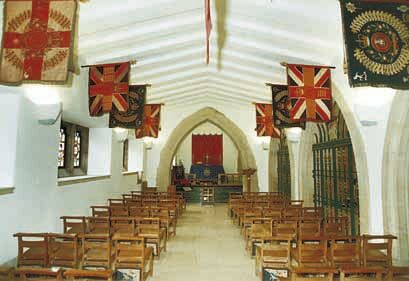 The Chapel stands as a testimony to over three centuries of honourable tradition of service, gallantry and sacrifice. On 19 July 1959 the Chapel was dedicated to the Honour of King Charles the Martyr (Charles I, father of Charles II) because the Garrison Church in Tangier had had the same dedication and the Regiment worshipped there regularly.